Posted by Lawrence Public Library Staff April 16, 2018 at 1:18 p.m.
Like many people, I spent a fair amount of time in my teenage years writing poetry. Some of it was quite good (I even won some state-wide awards for it! ), but most of it was pretty average. Eventually I stopped feeling the urge to write, and gradually poetry went from being a daily part of my life to something I thought about rarely, if at all. In the past couple of years, though, I’ve found myself reaching for poetry more regularly. From classics like Langston Hughes’s "The Weary Blues" to recent collections like Yrsa Daley-Ward’s "Bone," when I’m in the mood to just immerse myself in what language can do, there’s nothing else like poetry. The single biggest driver in getting me back to poetry, though, has been discovering verse novels. Verse novels are books that use poems — usually, but not always, short poems of less than a page or two each — to tell a sustained narrative. Generally speaking, I'm not particularly plot-driven in my reading tastes, but I love seeing how verse novels tell a story while still retaining the focus on form. In honor of National Poetry Month, here are a few verse novels I've enjoyed. 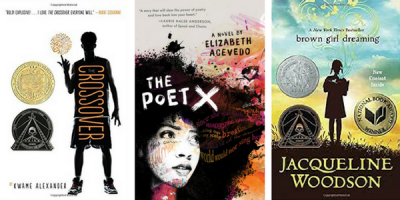 "The Poet X" — This novel is the fiction debut of National Poetry Slam Champion Elizabeth Acevedo, and it's absolutely fantastic — moving, fast-paced and funny. You'll fall in love with 15-year-old Xiomara Batista, a blossoming poet discovering her talent with words while falling in love for the first time and trying to cope with her strict, religious parents. Acevedo performs the audiobook herself (available on Hoopla), and it's easy to understand why she's a champion performance poet; I kept delaying going to sleep so I could listen to just a little bit more. "The Crossover," "Booked," "Solo," and "Rebound" - When world-renowned poet Nikki Giovanni spoke at KU last year, she said that she'd taught many very good poets over the years, and one truly great poet: Kwame Alexander. I'm a huge fan of Alexander's work, so it was thrilling to hear him name-checked by such a legend. You can't go wrong with any of Alexander's verse novels, but my personal favorite is "The Crossover," about basketball and family and friendship and loss. I'm especially excited to get my hands on "Rebound," the newly released prequel to "The Crossover." I'm excited to read more in this form, so help me out, readers — what are your favorite verse novels? — Meredith Wiggins is a reader's services assistant at the Lawrence Public Library.